In Path of Exile, players can acquire equipment and various currency items through the vendor recipe system by selling certain items to one of the vendors in town. A mix of multiple items or semi-specific items are placed into a sell window and a final product is received, according to a matching recipe. There are many pretty helpful Path of Exile vendor recipes that can make POE player experience much easier. These are some of them. The required combination of items that can be sold in return for the orb(s) is: a 2-Handed Weapon or a 1-Handed Weapon and a Shield, Head, Gloves, Boots, Chest, Belt, Amulet, and two Rings. If you don't know how too see item level in poe simple hold the alt key and move your curser over it it will show item level. If you don't have items to craft chaos orbs you can buy them from us, follow the link below. By using this very simple recipe, players can easily upgrade their maps. What is necessary are 3 identical level maps which combined give out one map which is a level higher. Each of the maps has to be completely the same in order for this vendor recipe to work. Apart from that, it seems that the rarity of the map equals the lowest rarity of the used ingredients. Also, map recipes can be exchanged for a gavel, rock breaker or a stone hammer, our detailed Path of Exile Map Guide can be found here. In order to acquire a Cartographer´s Chisel in Path of Exile, the following recipe should be used: 1 Stone Hammer/Rock Breaker/Gavel of 20% quality and any kind of map. Both the Map and Hammer can be rare, magic or normal. This PoE vendor recipe is very useful for increasing the level of your skill gem, while leveling. It increases the degree of cold/fire/lightning gems mod by 1 of an item. This could be done by combining a Magic Wand/Sceptre, Topaz Ring (Lightning Gems)/Sapphire Ring (Cold Gems)/Ruby Ring (Fire Gems) and an Orb of Alteration. Another recipe can be used to downgrade the Ability Gem by 1 level and it consists of combining 1 Ability Gem and 1 Orb of Scouring. This will reduce the level of your talent gem by 1. 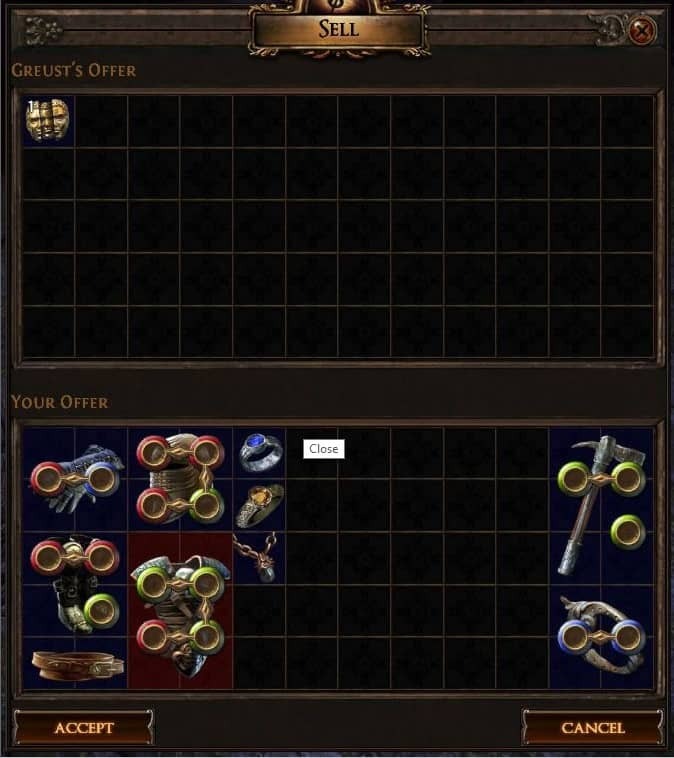 In Path of Exile Vaal Orbs are uncommon currency items which corrupt items, with results which could be very powerful but also unpredictable. These Orbs can be acquired from vendors using the following recipe: 7 Vaal Skill Gems + 1 Sacrifice Vaal Fragment at Dawn/Noon/Dusk. If you need some additional currency while you are out there leveling, there is a pretty simple recipe that can help you out. Combining 1 Ability (any) Gem of level 20 and 1 Gem´s-cutter Prism will produce a completely same Gem, but of level 1 and with 20% high-quality. A good strategy to follow, to make a bit more Path of Exile currency, is to get some decently high-level gems and put them inside your swapped weapon sockets in order to increase their level. When they reach level 20, by using this recipe and promoting 20% high-quality gems, you can earn a nice amount of currency.